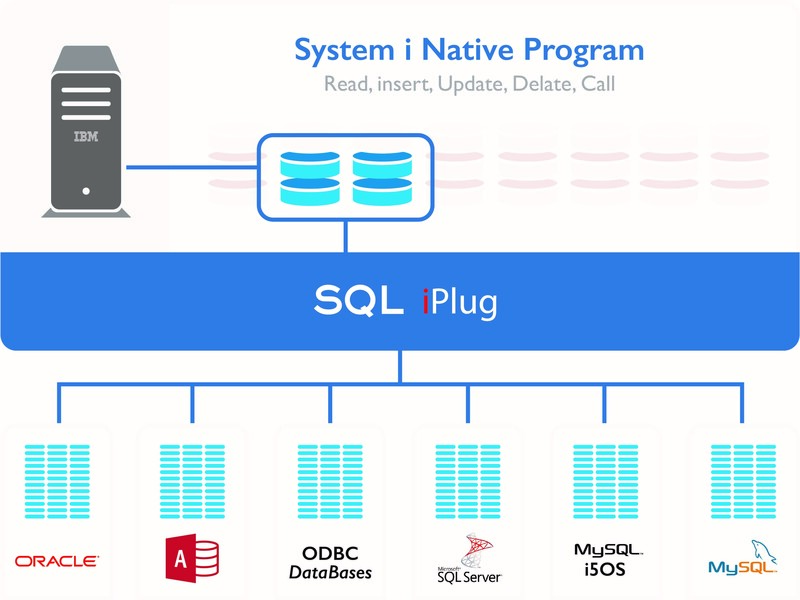 SQL iPlug provides System i applications real-time access to heterogeneous and external databases (Oracle, SQL Server, MySQL, MS Access, Sybase, Progress) in a completely transparent manner and without requiring replication. SQL iPlug facilitates access to tables and procedures through quick and easy Read, Insert, Update, Delete, and Call methods. Native IBMi applications monitor business data and procedures for all IBMi languages (RPG, COBOL, CL, etc.). Main functions: Read, Insert, Update, Delete, Call. Procedures stored with Input/Output parameters. Procedures with single or multiple results. Complies with database server security regulations. Data conversion formats to and from program variables. Supports leading database management systems such as Oracle, SQL Server, MySQL, MS Access, Sybase, and Progress. For batch or interactive programs. Compatible with all OS/400 AGL’s. Quick and compact installation and use. Complete integration with all of your IBMi databases. Unification of manipulation, distribution, and publication of heterogeneous data. Real-time processing over all of your databases. No data desynchronization since replication is avoided.